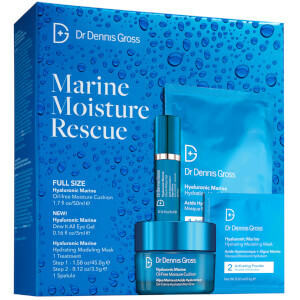 The Dr Dennis Gross Skincare Marine Moisture Rescue Kit combines three hydrating skincare products to leave the complexion feeling refreshed and radiant. A unique water-break gel-cream formula that delivers lightweight hydration to leave skin feeling dewy, supple and plump. Ideal for all skin types, the moisturiser contains Japanese Marine Algae (harvested from the waters of Okinawa) and Hyaluronic Acid Chronospheres to lock in moisture. Skin appears visibly improved with a smoother look and better elasticity. Ideal for all skin types. Phthalate free. A cooling gel-cream to leave the under eyes feeling refreshed and hydrated. Delivering up to 72 hours of hydration, the energising eye treatment addresses multiple concerns of the delicate under eye, including dryness, puffiness, dehydrated fine lines and dark circles. Formulated with Hyaluronic Acid, Marine Algae, and Caffeine to leave skin feeling fresh, moisturised and revitalised. A two-step gel and powder treatment that works to dissolve impurities and restore a dewy, radiant complexion. Fortified with Glycerin, Hyaluronic Acid and professional-grade Algin, the Cushion Gel and Activating Powder mix together to create an ultra-hydrating formula that infuses moisture and minerals deep into the skin, whilst minimising the appearance of dry surface lines and improving the skin's water holding capacity. Delivers a plumping effect to reveal a smoother, firmer and more refined complexion. Moisturiser: Delivered in a unique water-break gel-cream, this enriched formula features Japanese marine algae and hyaluronic acid chronospheres to lock in moisture and keep skin looking dewy, supple, and plump all day. Eye Gel: For AM/PM use. Tap a small amount gently around the eye area. Mask: Once a week – mix Hyaluronic Cushion Gel (Step 1) with Activating Powder (Step 2) in a bowl. With the supplied spatula, immediately spread the formula in a thick, even layer on clean, dry skin – starting from the bottom of your face and working in upward strokes. Avoid the eye area. The thicker and more uniform the application, the easier it will be to remove the mask in one piece. The mask will set within 5-7 minutes, but may be left on for up to 15 minutes for maximum hydration. To remove, lift off the mask and wipe away any excess with a damp cotton ball. No rinsing needed! 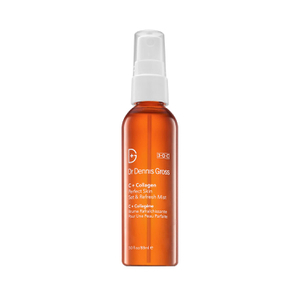 Follow with a serum and/or moisturiser of your choice from Dr. Dennis Gross Skincare™. Moisturiser: Water, Cyclopentasiloxane, Cetearyl Alcohol, Dimethicone, Butylene Glycol, Stearyl Dimethicone, Caprylic/Capric Triglyceride, Octadecene, Glyceryl Behenate, Sodium Acrylate/Sodium Acryloyldimethyl Taurate Copolymer, Sodium Hyaluronate, Caulerpa Lentillifera Extract, Aloe Barbadensis Leaf Extract, Tocopherol, Phospholipids, Citrullus Lanatus (Watermelon) Fruit Extract, Cocos Nucifera (Coconut) Fruit Extract, Citrus Sinensis (Orange) Fruit Extract, Cinnamomum Cassia Bark Extract, Saccharide Isomerate, Vaccinium Myrtillus Fruit/Leaf Extract, Glycolic Acid, Lactic Acid, Saccharum Officinarum (Sugar Cane) Extract, Citrus Aurantium Dulcis (Orange) Fruit Extract, Citrus Limon (Lemon) Fruit Extract, Acer Saccharum (Sugar Maple) Extract, Collagen Amino Acids, Hydrolyzed Soy Protein, Leuconostoc/Radish Root Ferment Filtrate, Lactobacillus Ferment, Acrylates/Carbamate Copolymer, Isohexadecane, Polysorbate 80, Dimethicone Crosspolymer-3, Ethylhexylglycerin, Isododecane, Disodium EDTA-Copper, Ceteareth-20, Potassium Cetyl Phosphate, Sorbitan Oleate, Linalool, Limonene, Fragrance (Parfum), Hydroxyisohexyl 3-Cyclohexene Carboxaldehyde, Citronellal, Hydroxycitronellal, Citral, Citric Acid, Sorbic Acid, Phenoxyethanol. Mask: (Step 1) Water/Aqua/Eau, Glycerin, Algin, Lithium Magnesium Sodium Silicate, Sodium Hyaluronate, Oryza Sativa (Rice) Powder, Xanthan Gum, Citric Acid, Disodium EDTA, Conchiolin Powder, Dehydroacetic Acid, Benzyl Alcohol, Fragrance (Parfum), Blue 1 Lake (CI 42090). (Step 2) Glucose, Calcium Sulfate, Tetrasodium Pyrophosphate, Magnesium Oxide.